LG today announced its flagship handset for 2016, the G5. 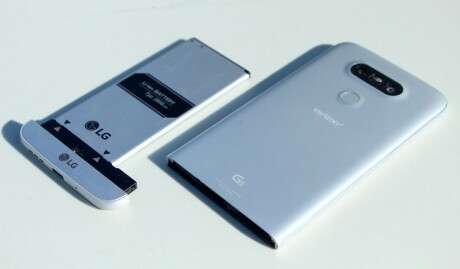 The phone represents a re-think from LG, which has altered the design and functionality entirely from earlier G models to help set it apart from competing phones. The G5's stand-out feature is a removable hatch that opens the battery compartment and also allows modular accessories to be added to the phone, such as a camera grip. Other significant changes include a shift from plastic materials to metal, and relocating the volume buttons from the back of the phone to the side. The power button, which doubles as a fingerprint sensor, remains on the rear panel. The G5 has a 5.3-inch quad HD display and is powered by a Snapdragon 820 processor with 4 GB of RAM. The main screen includes an always-on feature similar to the V10, but without a separate screen. It has minima, power requirements. It comes with 32 GB of storage, but supports memory cards up to 200 GB. LG bestowed the G5 with dual rear cameras. The main shooter rates 16 megapixels at f/1.8 and a normal 75-degree field of view. The second camera rates 8 megapixels and has a wider, 135-degree field of view. Both cameras are assisted by laser focus and can capture 4K video. The user-facing camera has an 8-megapixel sensor and captures full HD video. Other hardware features include a 2,800mAh battery with Quick Charge 3.0, USB Type-C, Bluetooth 4.2, GPS, NFC, WiFi, and of course LTE. The phone runs Android 6.0 Marshmallow and LG toned its user interface skin way back. The LG G5 comes in four colors (silver, titanium, gold, pink) and will be sold by major U.S. carriers come April. Pricing was not revealed. I agree with you 100%. The G5 certainly looks like an impressive device. And they beat everyone to market with the ability to attach accessories (something we should have had a decade ago). Well done, LG.